Bells tinkle as donkeys clamber up the steep paths that wind through the village of Badhiara. Two thousand people live in the houses scattered along the side of this mountain in Pakistani-administered Kashmir. Fifty died in the earthquake. Forty-nine of them were children. 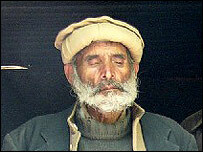 The village prayer leader is Maulvi Abdul Khaliq. He's a small, quiet man with a wispy white beard and one blind eye, dressed in a purple scarf and thick jumper despite the noon-day heat. Two of his young sons were killed when the school collapsed. "I miss them very much," he says, once again recalling the events of that day, in which 75,000 people were killed in Pakistan and India. "They didn't want to go to school, but their mother forced them. "I remember watching them go down this road, and they didn't return." The maulvi's elder son Abdul Qadir also wrestles with his memories. "The village lost so many children," he says. "We went down to the school and I saw my brothers lying there with their heads smashed. I felt as if I was losing pieces of my own heart." But where there was desolation, there is now, gingerly, life. At the bottom of the slope, on the foundations of the destroyed school, children study in a tent or in the open air. Things have become easier with the passage of time. "In the first three months the students were very fearful," says teacher Khosa Perveen. "Whenever their desks would shake they thought it was another earthquake, but we told them it wasn't. And afterwards, when they would hear rumours of an earthquake, they would come and talk to us." 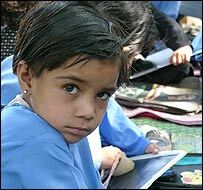 The destruction of schools was perhaps the greatest human tragedy of the earthquake. Eighteen thousand pupils were killed in a matter of minutes as more than 6,000 buildings collapsed on top of them. A year on, few have been rebuilt. Students are crammed into temporary structures, some of them state of the art pre-fabricated shelters, but most of them tents and other makeshift arrangements. Still, given the trauma through which the children have been, temporary structures may have been a blessing, says Nina Hjellegjerde, an education officer for the UN Children's Fund. "Part of why we decided to go for the tents as the initial response was because we weren't sure of the psychological impact of buildings, or the children's level of comfort in buildings, and I think that's been a correct assumption at the early stages." Fear persists, though, aroused anew by the anniversary of the disaster. Abdel Hamid pulled his 12-year-old daughter from the rubble of the school. "She has been asking me whether there would be another earthquake on the 8 October," he says, "and I've been telling her no. Also school attendance was very thin on the third day of Ramadan, because that was the day [in the Muslim calendar] that the earthquake happened." Sitting on the grass in the warm sunshine, several of the children talk about that terrible day. "The earth was shaking," says 10-year-old Kainad Khalil. "We were stumbling, we fell, we stood up and then we fell and we rushed out. "I was afraid to come back to school because I thought it could happen again." 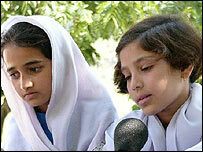 "I'm not afraid because our teachers encourage us," offers her friend, Uzma Anwar. How would they feel about going back to school inside a building? "Building a school is fine," ventures Kainad. "No, this tent is good," counters 12-year-old Ghazanfar Mehboob, "because I don't feel any fear here. In the building, I will feel fear." A few of the others nod in agreement. In Badhiara some people are beginning to rebuild their homes, and the villagers do plan to restore the school. When they do, it will be with tentative hope for a better future. But such was the trauma of the quake they are always prepared for the worst.